Integrate the most effective software systems with your fast-moving operations. All Triniti consultants have extensive business knowledge that complements a technical foundation. At Triniti, we firmly believe that technology should always be aligned with business needs and realities, and that the key to a successful implementation is a professionally led team with both business and technical expertise. As a recognized implementation leader for Oracle e-Business Suite, we design products that deliver finely tuned, robust environments that support consistent, fact-based decision-making in real time. We also provide best-in-class solutions that are specifically designed for the needs of various verticals such as High-tech Manufacturing; Engineering, Procurement and Production; and the Fabless Semiconductor industries. Triniti helps you realize the full potential of Oracle's cutting edge ERP technology. Our expert consultants have implemented and enhanced hundreds of Oracle systems for Fortune 500 companies. Triniti consultants have the knowledge, experience, and attitude to successfully produce the most effective and efficient Oracle system your business needs. Benefit from the knowledge of more than 100 fulltime employed consultants in Oracle E-Business suite. Get Big 6 brand quality at boutique rates. At Triniti, we have been implementing, supporting, integrating and enhancing Oracle E-Business Suite for over 17 years. Our consultants are well-trained in all the skills required for a successful implementation. Due to the highly configurable nature of Oracle, implementations can quickly become expensive, unreliable, shallow or poor in quality, sometimes hindered by the traditional model of segregating business, functional and technical consultants. 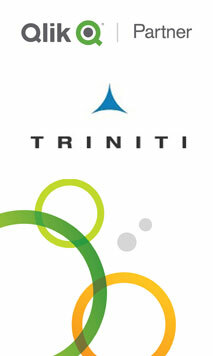 Triniti consultants are well-equipped with all three functions. This minimizes the risk of running into future problems, requiring less coordination, improving the quality and reducing the time. Further more, they are knowledgeable in multiple modules of Oracle, reducing errors in inter-module integration. Over a decade ago, Triniti did pioneering work in Oracle VCP modules when some of these modules were very nascent. This resulted in several critical enhancements to the Rules Based Optimization Engine and gave us in-depth insight into the schematics of the planning engine. That, coupled with the experience of working with very highly experienced master planners, has given us a pool of consultants who have the outlook of a supply chain business user with the ability to translate that into a model best suited for planning and execution. Make Faster and Smarter Decisions with OBIEE. If you are frustrated with BI applications and are unable to recover your investments in OBIEE, talk to us about a simplified architecture that leverages the database technology of Oracle. Our approach not only insulates the transactional database (OLTP) from performance degradation, but also improves the availability of the dashboards and trends in OBIEE. With other consulting companies, you get consultants who either know OBIEE or Oracle E-Business suite. Additionally with BI Apps you also need expertise in Informatica. With Triniti's simplified architecture and consultants who know both OBIEE and E-Business Suite, it is efficient and cost effective. Triniti has trained close to 60 consultants in Oracle Integrated Operational Planning (IOP), as it believes IOP solves a business problem that has not been solved before. Triniti has pioneered sales wins at Marvell semiconductor and Peregrine Semiconductor to implement IOP. Triniti will help you configure IOP to achieve the optimum benefits from financial, sales and operations planning. Additionally, if you have trouble implementing "thick" demand planning tools from Oracle, SAP, i2 and Adexa (for field sales as they prefer highly usable Excel formats), then Triniti can help you implement lightweight excel based demand planning solutions using IOP. Triniti’s historical expertise in the legacy Oracle planning products (ASCP, Demantra, Oracle Demand Planning) will help you seamlessly integrate IOP into the Oracle landscape. With Triniti and IOP, you can finally link operational plans to financial results and have Timely, Reliable, Accurate and Complete actual gross margin. 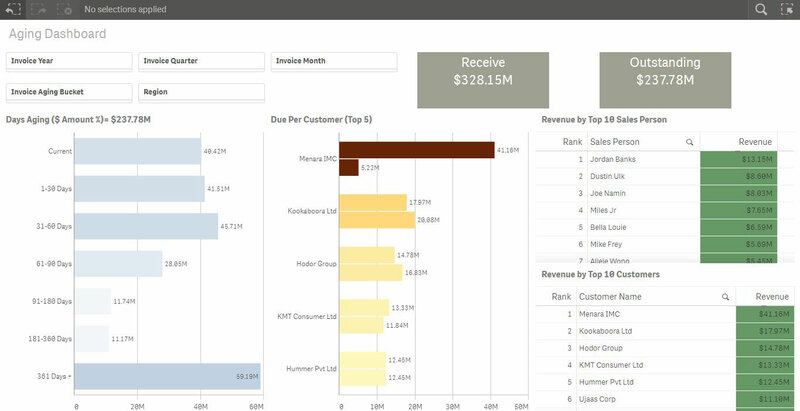 Get instant Intelligence with Triniti's pre-built Qlik dashboards. 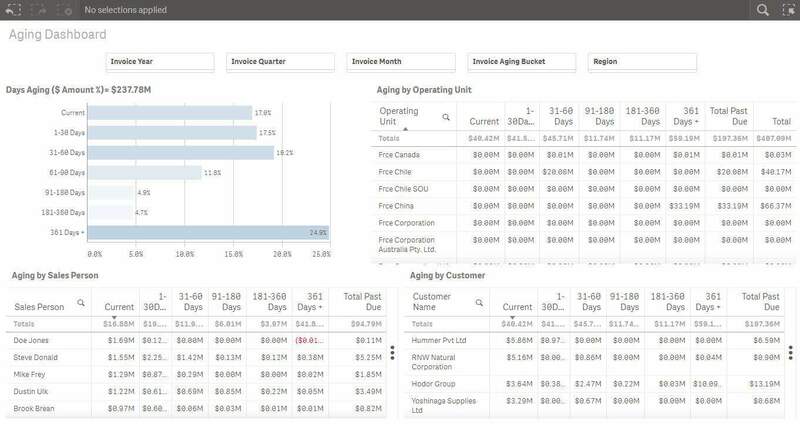 Qlik has become an industry leader for Business Intelligence. Triniti’s Qlik consultants are experts in Qlik and Oracle Ebusiness Suite. 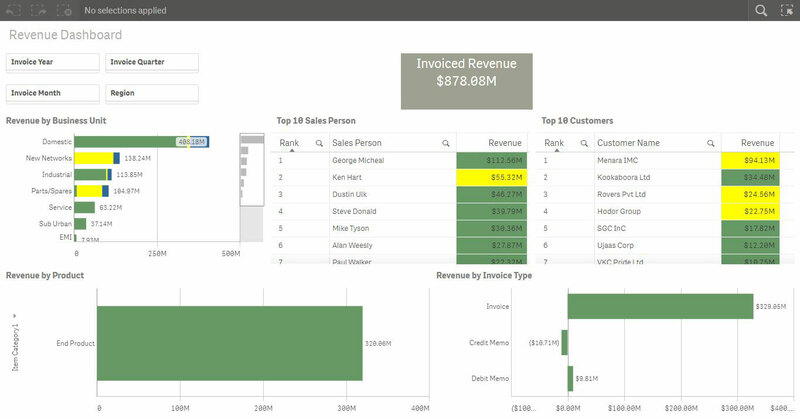 This has helped our customers achieve great value from their investments in QlikView and Qlik Sense. Leveraging that experience, we have created dashboards that need just 10% customization. We can now bring you on board within 30 days for these Sales Dashboards. Triniti is also an authorized reseller of Qlik Software. If you buy Qlik from Triniti, you will get 50% discount on our dashboards. The screenshots of the dashboards are shown below. Summary Dashboard - This provides you an immediate view of your gross margin, revenue and top customers for the period. It also gives you a view of returns to indicate if there any process issues that you need to address. Aging Dashboard by Operating Unit. Assuming you have modeled business units as Operating units in Oracle EBS, you can look at how collections are performing by business unit. 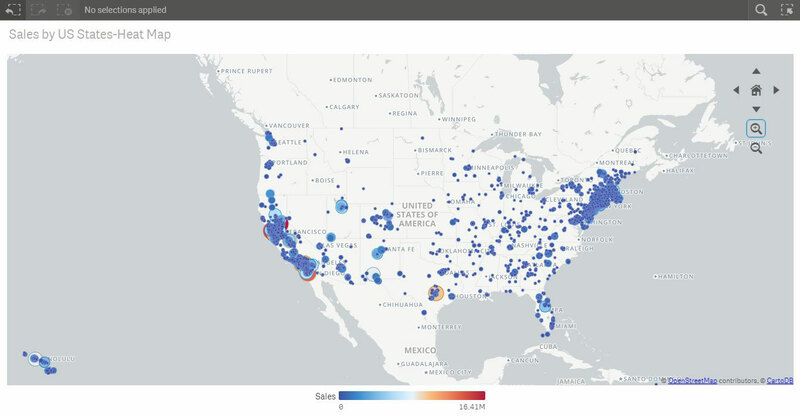 Sales by US Heat Map. An example of how you can visualize where your revenue is coming from. This dashboard in not confined to the US but in any geographical region of the world. Speed up your Kinaxis implementation by leveraging the deep knowledge of our consultants of supply chain and fulfillment processes. We also offer a ready-to-use integration to Oracle EBS. With Oracle EBS, and using Oracle Projects and the supporting Financial and Manufacturing Applications, we can help you track your EPC (Engineering, Procurement and Construction) contracts and projects from realization, design and engineering, prototyping, project tracking, implementation (procurement, manufacturing, construction), shipping and receiving, project costing, project billing and financial accounting. You will have complete visibility and control of the project at all times with flexible configurations that will map to your industry requirements, security per project and organization, accounting requirements per local statutory mandates, intercompany cross project cooperation and coordination, project capitalization and global reporting dashboards. With over 17 years of experience in this space, we have developed in-depth knowledge of this industry. This in turn gives us an edge as we are able to bring completely thought out and tested solutions to the table right in the beginning of any project. As this was the area that Triniti began its journey as a company, a lot of our happy customers exist in this space.